taught by passionate and professional instructors. Here, you'll find an uber-friendly and approachable staff in a welcoming environment combined with a carefully designed, results-driven and progressive fitness program. 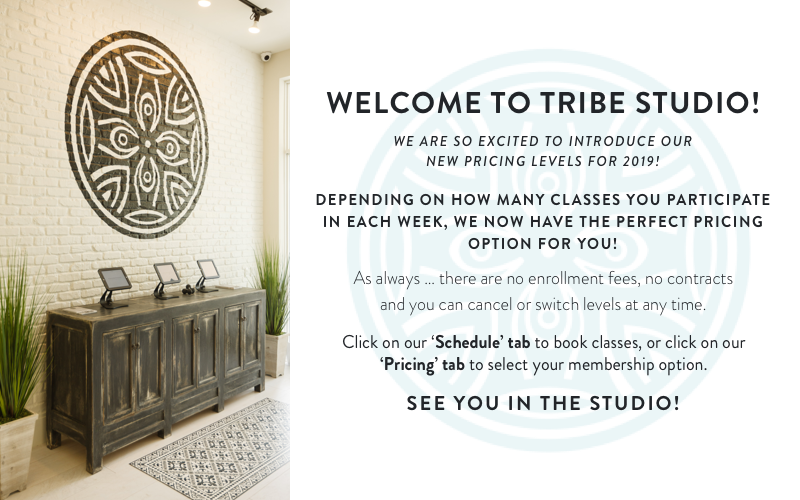 Tribe Studio is a unique and very special group fitness studio…unlike any other you’ve seen. Every day, every time slot and every class at Tribe has its own personality. Each instructor has their own approach and interpretation of the class format…like it used to be! No ‘branded’ programs here – just freestyle instructors teaching from the heart. We boast highly-appointed spa-like locker rooms, state-of-the-art sound system and instructor microphones, the latest and greatest group fitness equipment and much more. No need to run around town to several one-format small studios or the larger crowded gyms trying to find your favorite group fitness classes. Free up your key chain of the plastic bar-coded gym tags once and for all. Tribe offers you innovative classes in every fitness method and modality needed … let us cover all of the bases for you. "I was 40 something the first time I ever took a fitness class. I wasn't the "working out" type of person (or so I thought)! I took my first class with Tiffany over 3 years ago and it was so much fun! You can actually feel and see the magnetic energy of everyone in the class...it's awesome! Tiffany's moves are so amazingly precise! I love and appreciate how she motivates me to keep in shape." "I have always struggled with my weight. I tried all kinds of training, but nothing really worked for me. Three years ago my wife forced me to attend one of Tiffany's classes. I am so grateful because that was a turning point for me. It was challenging class, but at the same time a lot of fun, full of energy, excitement and variety…and it didn’t matter what fitness level I was. Sometimes I was the only man there, I guess most men think classes are only for women, but I can assure you that they are beneficial for both men and women. I would advise anyone that wants to get in shape and have fun to join Tribe Studio." "I just moved to Florida, leaving a gym I loved in Atlanta. I was hesitant on whether or not I’d find a someplace comparable. I was so lucky to have found Tiffany Bowers. Tiffany embodies variety and is always making changes in fitness levels. Through consistent, positive feedback and encouragement, she improved my fitness level. I’ve gained more confidence to walk into any fitness studio and know I can do it. She quietly discovered the athlete in me that I was afraid I could’ve lost being new to the area." "I love the instructors so much! They make me more motivated and stronger every day. Also, I've made so many friends in all the classes, which is something special and hard to find." "Tiffany and her team’s fitness classes are ‘hands down’ the best I have ever attended! Always a positive environment, great music, great intensity, and never boring -- in one hour all major muscle groups are worked, plus many muscles I did not know I had! The atmosphere is very inclusive to all levels, but challenges even the very fit folks among us. To prevent injuries, there is a tremendous emphasis on proper form and they always provide alternate exercises to lower intensity where needed or desired. Since I started taking classes, I have seen significant definition in the muscles in my arms, shoulders, and back, after always just being a runner. In a nutshell … class is always a great time with wonderful people, a great workout, and I ALWAYS come out FEELING WAY BETTER than I came in! Thank you so much Tiffany, you're amazing---love you!!" "If you are ready for a serious workout to change your mind, body & soul, this is the place where you’ll want to be. Instructors are all top notch and truly interested in meeting your individual goals. Friendly atmosphere and no judgment. Competition is fierce but loving - that's what a Tribe is all about." "The first time I ever took a class with Tiffany, I knew I was in for something different. The class was high energy, super challenging and fun! And in the 5 years I have been working out with her, Tiffany continues to change it up, find new moves to motivate us and always offers alternatives for all fitness levels. Through Tiffany, I have been privileged to also take classes with Amanda, Eileen, Sam and Shaun. Each instructor is so knowledgeable and inspiring. What I love the most about all of these women is how supported I feel. They truly care about my health, my fitness and my progress." Tribe Instructors have their own creative approach and unique interpretation of each class format. You will not see any ‘branded’ programs on our schedule. All certified in their craft, all trained to understand music, tempo, safety, form, alignment and most of all – how to get results!